Here at Dormston we place great importance on appearance. We expect all of our students to wear the full school uniform correctly, and with pride. This applies both within school, outside and when travelling to and from Dormston. 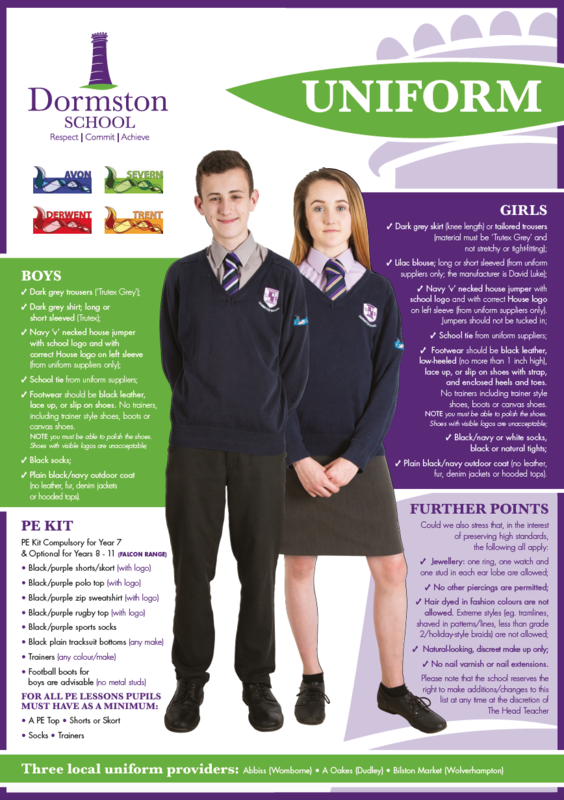 If in any doubt about a particular item of clothing, please contact the school before purchasing to avoid your child not meeting our uniform regulations. Dormston house colours are worn on the school jumper badge and summer polo shirt. Please make sure that you select the correct house colour when purchasing your uniform. For all PE lessons pupils must have as a minimum; a PE top, shorts or skort, socks and trainers. Tracksuit bottoms and sweatshirts can be worn at the discretion of the PE Staff. The school summer uniform can be worn from the start of the Summer term up until the end of the school year. Both boys and girls are allowed to wear the school polo shirt, which is branded with the school logo on the front and the house logo on the left sleeve. Please make sure that you purchase the correct house colour for your child. School jumpers must still be worn during the Summer term unless permission is granted otherwise. Pupils can continue to wear their winter uniform if desired, however they must comply with the winter uniform rules.